This one isn’t technically wild; he was captured by my snake removal service at a home in Phoenix and this is the the wash where he’s released. I don’t usually photograph the releases, but he looked cool on the white rocks, so here he is. Gophersnakes like this are the second most common animal I am called to capture around Phoenix. Western Diamondback Rattlesnakes are the first. This entry was posted on Monday, September 26th, 2011 at 8:45 am	and is filed under Field Herping, Relocation & Rescue, Snakes. You can follow any responses to this entry through the RSS 2.0 feed. You can leave a response, or trackback from your own site. However, there has been an explosion of gophers and I could use a few hundred or thoushands of those guys released right here! 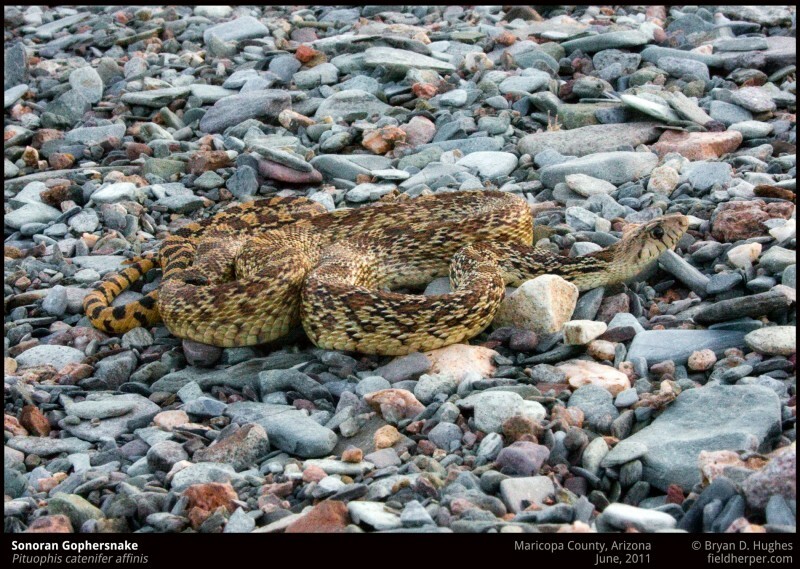 I just recently discovered that the Sonoran Gopher Snake actually has a diamond pattern in its markings. I still can tell it’s a Gopher Snake by its overall look, the colors and the rest of the pattern. I think it’s cool, but I suspect that a lot of people are fooled by it into thinking it’s a rattler, and wind up killing it. BTW, I was just given a baby Snow Corn Snake! She’s a real cute little snake. The pattern is almost always much more of a cross-hatch of different shapes than the easily counted diamonds of the rattlesnakes, though I have seen a few ‘clean’ animals that could give the impression. In my dealings with people who mistake them for rattlers (quite often, several a week in fact) and call the hotline to report it, most are fooled not by the pattern, but by the behavior of the snake. When they’re threatened they will flatten the head, hiss loudly, and even rattle their tails. To someone who hasn’t actually seen a rattlesnake being defensive, and with the fear this would bring, I can imagine scrutinization is at a minimum. Yeah, I see the “diamonds” in that cross-hatch pattern, but you’re right; they’re not as distinct as a rattler’s diamonds. And their bluff is extremely effective.